Preparation Methods & Dosage :Add yucca powder to food, take in capsule form or extracts. Yucca root makes a very mild tasting, pale yellow tea that combines well with ginger, licorice and ginseng. In the Kitchen: Cassava Root, Manihot esculenta., shares the common name yucca, but is not related botanically. The starchy root is eaten in lei of potatoes in South american dishes. Yucca Side Effects: Overuse may cause indigestion. It is recommended to give a two day break from the herb each week, if using over a long period of time. Yucca is traditional favorite of Native Americans that grows primarily in the dry coastal canyons of California and the inland deserts of the western United States. Older scholars considered it a member of Agavaceae, while it is most currently placed in the Lily family. The one thing everyone agrees on is that yucca is not a cactus. The various species differ primarily by their size, with Y. brevifolia, the Joshua tree, growing up to 20 feet tall. 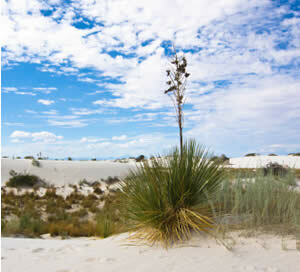 Most species including the more common Y. schidigera, the Mojave yucca grow as a 1 to 6 foot high clump with sharp and swordlike leaves and beautiful cream colored flowers. It is this species the is the primary on marketed by the natural products industry. 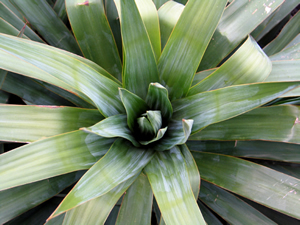 Many Native American tribes uses yucca as a food, and it has traditionally been used as an arthritis remedy. It has been postulated that saponins may have anti-arthritic properties by suppressing intestinal protozoa which may have a role in joint inflammation. Yucca is also a rich source of polyphenolics, including resveratrol and a number of other stilbenes (yuccaols A, B, C, D and E). These phenolics have anti-inflammatory activity. They are inhibitors of the nuclear transcription factor NFkappaB. NFkB stimulates synthesis of inducible nitric oxide synthase (iNOS), which causes formation of the inflammatory agent nitric oxide. Yucca phenolics are also anti-oxidants and free-radical scavengers, which may aid in suppressing reactive oxygen species that stimulate inflammatory responses. Based on these findings, further studies on the anti-arthritic effects of Yucca schidigera are warranted. Researchers at the Second University of Naples in Italy concluded that the anti-inflammatory properties attributed to Yucca schidigera may be ascribed to both resveratrol and Yuccaols and provide the first evidences of the anti-tumor and anti-invasive properties of these phenolic compounds.